Over a hundred people gathered for an emergency rally outside Senate House this afternoon in support of the ongoing occupation of Old Schools and the recent industrial action. 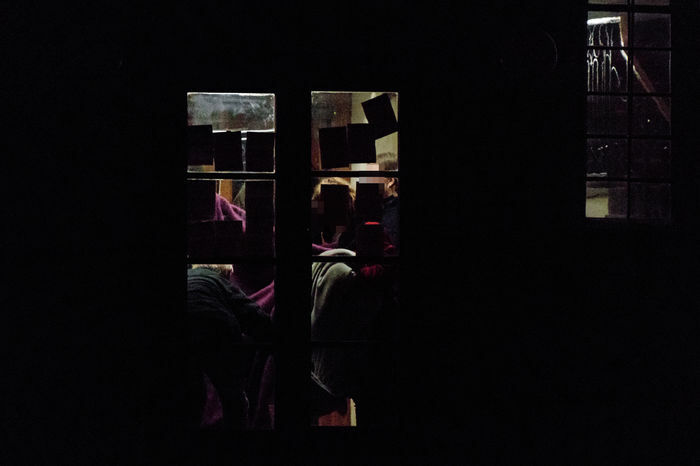 Some activists were witnessed climbing through windows facing King’s Chapel in order to join the occupiers, while supporters outside chanted and banged on pots, pans and drums in support. The occupation is in support of Universities and College Union (UCU) industrial action triggered by recent changes to pension plans proposed by Universities UK (UUK) last November. These controversial plans involve replacing ‘defined benefit’ pension schemes with ‘defined contribution’ pension schemes for incomes under £55,000, which, according to analysis by First Actuarial, could leave staff as much as £200,000 worse off. Students have been occupying Old Schools, which houses the central University offices and the office of the vice-chancellor, since yesterday evening, when around 30 members of Cambridge Defend Education (CDE) entered the building. Today, a significant number of students joined the original occupiers after climbing through a window overlooking King’s College, while others briefly visited to offer their support and solidarity. Some shook hands with fellow activists through an open window, and students, both inside and outside, united in chants and in song. This came shortly after demonstrators passed food and blankets to occupiers through the Old Schools gates, which were temporarily opened by security, amidst cheering. Dr Jeff Miley, Sociology lecturer and senior Cambridge UCU member, briefly entered the Old Schools through a window to speak to the student activists inside. According to Miley, morale among occupying students remains “excellent”. The Cambridge UCU branch voted this morning to reject the proposed agreement made yesterday between the UCU and UUK, which would offer a transitional pensions agreement lasting three years. The proposed agreement would maintain “a meaningful level” of defined benefits, and both employers and members would be required to pay higher contributions to make this possible. At this morning’s emergency meeting of the Cambridge UCU, which was called last night, tensions arose as the room debated whether or not to accept the agreement. Ultimately, it was narrowly rejected, a move that has been mirrored by Oxford UCU and other local branches of the UCU. There are unconfirmed reports that UCU has since withdrawn the controversial agreement. Mentions of the agreement during the rally were met with loud boos from demonstrators: one speaker described the proposals as “pathetic” while another described them as “a slap in the face”. Many at the really – including CUSU education officer Martha Krish – encouraged students to continue offering their support to striking staff. Along with pots and pans, some attendees brought banners and placards, including one reading “U UK hun?”, referencing UUK’s unpopular plans for pension reform which prompted the industrial action, now in its fourth week. Demonstrators chanted a number of slogans, including “Whose university? Our university.” and “What do we want? Fair pensions. When do we want them? Now.” They also repeatedly shouted “Let us in”, echoing CDE’s demand for open access to the occupation. When contacted regarding the occupation, the University confirmed that there is an “ongoing incident at Old Schools” and said that “security are on-site and working with protestors to ensure their safety and the safety of staff working in the Old Schools”, but declined to provide further comment. Follow our live coverage of the occupation here.